January 16th, 2019 over fifty immigrants, teachers and friends met at Magic House to network and share their stories. During this event there are two speakers, one adult and a youth either in high school or college. Building Momentum is a networking event and speaker series for immigrants and friends of immigrants, hosted by Vitendo4Africa. Vitendo4Africa hopes to build momentum for a better future by providing an opportunity for you to meet new people and hear community and youth immigrant leaders share their successes, failures, and lessons learned. Over the weekend the Kenyan Community in St. Louis hosted a colorful reception for the incoming US ambassador to Kenya, Sen. Kyle McCarter and his wife Victoria McCarter. V4A Youth Mentorship parent engagement component of our Youth Mentorship Program is a collaboration between V4A and similar community based organizations that share our passion for creating a healthier, cohesive support system for the Immigrant and refugee children. As community-led organizations, we are deeply committed to getting parents involved in their students’ education and playing a role in their educational success. Mission: We are a primary resource center and leading advocate for African business professionals in local, national, and international markets. Vitendo4africa celebrations its 5th Annual Dinner on October 20th at JFK Community Center.This year event was spectacular with great African fashion show by YKG crafts, African dance by F4KIDZ African Performing Arts, food and music. YKG is owned by immigrant entrepreneur from Zimbabwe, Ms Gamu Gandawa. During this time every year, V4A recognizes individuals and organizations who have, through positive actions, stood out to impact the lives of immigrants and refugees families in St. Louis. This year these individuals and organizations received awards in the following categories. Vitendo4africa is a non profit organization for immigrants by immigrants in Missouri. Vitendo4africa Founder and Executive Director, Mr Geoffrey Soyiantet shares his life experience from Kenya to USA and how his mother inspired him to start an organization that is impacting many lives both locally and internationally. Through youth leadership program, V4A organizes mission trip to Kenya during summer. The teens takes the initiative to host fundraising events, collect school supplies, backpacks, hospital supplies and other games items. They travel with these items for donation while on the mission. 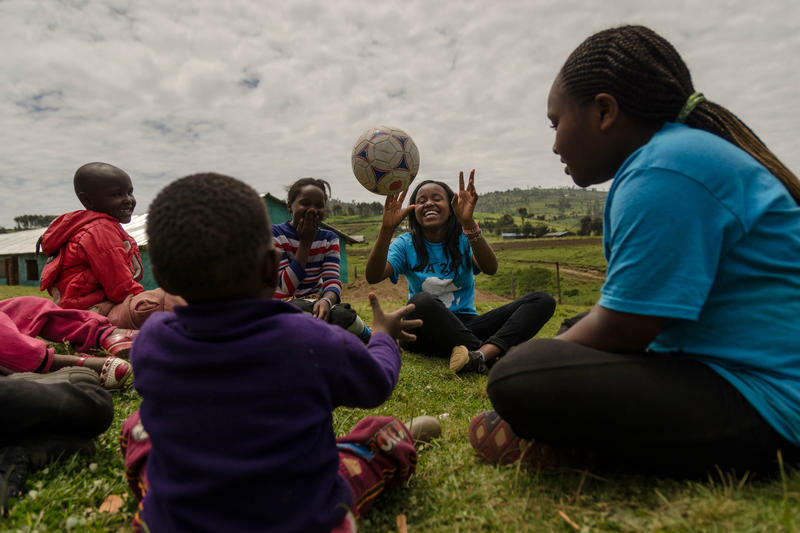 Sally Gacheru, center, tosses a ball to a child in Sakutiek, Kenya. Gacheru, who was born in Kenya but moved to St. Louis four years ago, was part of a service trip back home for fellow immigrant teens this month.